Take a guided tour of Machu Picchu, one of the New 7 Wonders of the World. Quito is UNESCO heritage listed because of its many fine examples of Spanish colonial architecture. 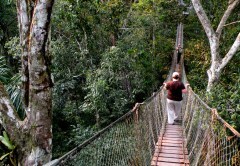 Take in a fascinating eco-tourism experience in the heart of the Amazon rainforest. Explore the Galapagos Islands on a small ship cruise and get up close and personal with its abundant wildlife. Day 2: Exclusive Lima tour. Day 3: Fly from Lima to Cusco. Afternoon at leisure to acclimatise. Day 4: Cusco city tour. Day 5: Tour of the Sacred Valley and afternoon train to Machu Picchu. 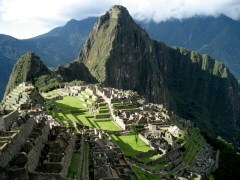 Day 6: Machu Picchu morning tour including option to trek Huayna Picchu. Return to Cusco. Day 7: Cusco to Quito. Day 8: Quito city tour. Day 9: Quito to Amazon Lodge. Begin your 4 day Amazon Lodge stay. Day 10-11: Amazon Lodge stay. Day 12: Amazon to Quito. 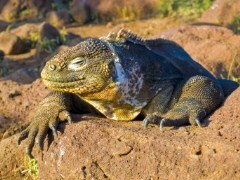 Day 13: Quito - Galapagos Islands: begin your 5 day Galapagos cruise. Day 14-16: Galapagos Islands cruise. Day 17: Complete Galapagos cruise and fly to Guayaquil. 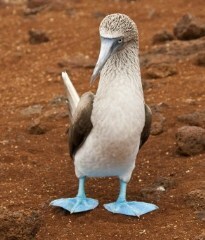 Extend your cruise to a 6 or 8 day cruise to maximise your Galapagos experience. Further explore underrated Ecuador with a trip through the Avenue of the Volcanoes. On arrival at Lima airport you will be met by our representative and transferred to your centrally located hotel. This evening is at your leisure and we recommend venturing into one of Lima’s many outstanding restaurants in the “Gastronomical Capital of Latin America”. In particular, we suggest you try ceviche, the national dish of Peru, which is a form of citrus-marinated seafood. Our representative will pick you up from your hotel and transfer you to Lima airport for your departure flight. On arrival at Cusco airport you will be met and transferred to your centrally located hotel. We suggest you take things slowly today in order to acclimatise to Cusco's altitude or even add in an additional day for relaxation. 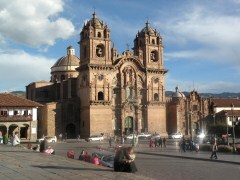 In the evening, there are many excellent restaurants to choose from in Cusco. We then continue our journey along the River Urubamba to Ollantaytambo, where you will visit to the Ollantaytambo ruins and one of its best preserved areas, Hanan Hucaypata. Catch the scenic afternoon train to Aguas Calientes where you will spend the evening and prepare for your early morning visit to Machu Picchu the next day. For those looking for adventure, we recommend the 1.5 hour trek up Huayna Picchu Mountain which overlooks Machu Picchu and allows for spectacular views of Machu Picchu and the surrounding area. Your return train through the Sacred Valley of the Incas to Cusco will depart in the afternoon and arrive in the early evening. 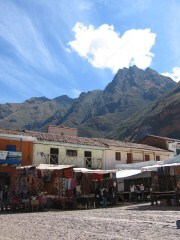 Includes guided tour and return bus from Aguas Calientes village and return to Cusco by train. 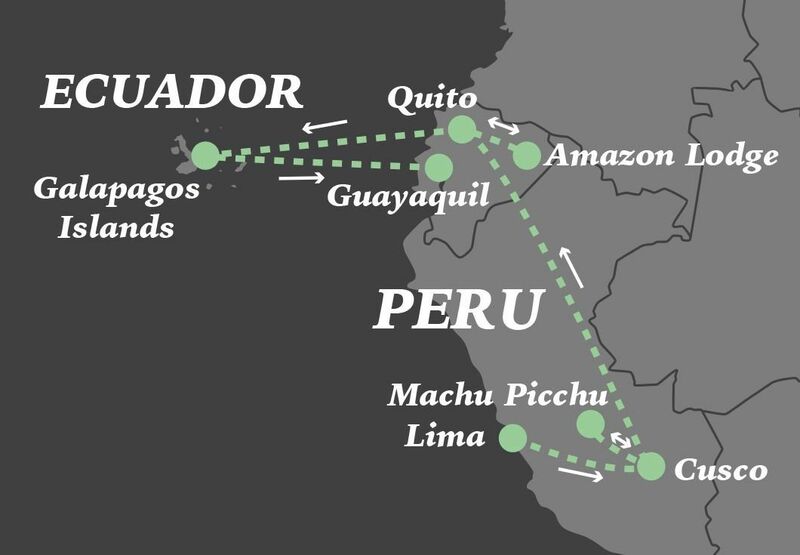 This morning we transfer you to the airport for your flight to Quito via Lima. 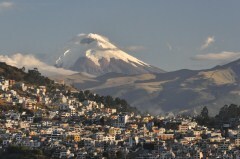 On arrival in Quito you will be met by our representative and transferred to your centrally located hotel. After breakfast, your guide and transportation will pick you up and take you on a comprehensive walking tour of the Colonial District of Quito. On this tour you will visit some of the most famous squares, churches and colonial buildings of the city including the Independence Plaza where you can admire the Cathedral, the Presidential Palace and the Archbishop’s palace. Furthermore, you'll visit the San Francisco Church and the Basilica of Quito, the oldest Church in South America, made almost completely out of volcanic stone. Then head to the 'Panecillo Mirador', the most famous hill of Quito, where you can take pictures of both colonial and modern Quito. While walking through the city, your guide will help you appreciate the eventful past of Ecuador including the Inca Empire, the Spanish invasion, and its push towards independence. Today we transfer you to the airport for your 30 minute flight over the eastern Andes mountain range to Coca which is the entrance point to the Yasuní National Park – a UNESCO Biosphere Reserve and the largest area of tropical rainforest in Ecuador. The Yasuní National Park sits at the intersection of the Andes and the Amazon regions, and offers a variety of excellent lodges where you can experience the rich biodiversity of the area. From the airport you are met and transferred to the Napo River where we start a canoe ride to your lodge approximately 2 hours away. Along the way you will enjoy a delicious lunch whilst keeping an eye out for birds like herons, kingfishers, toucans, parrots and macaws. You will arrive at your lodge and after a briefing you will have the opportunity to take part in the afternoon and evening activities included. All activities and meals are included during your stay. Visit a clay lick where several species of parrots, parakeets and macaws can be seen feeding. 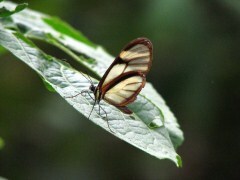 Discover unique rainforest creatures from the rainforest canopy. Hike the trails in and around your lodge and learn about the flora and fauna of the region with a naturalist guide. Visit native Indian communities and learn about their culture and way of life. Evening hiking or canoe rides which allow guests to hear the nocturnal sounds of the jungle and to look for bats, caiman, snakes, spiders and a variety of other insects. This morning you will enjoy breakfast before we return to Coca along the Napo River which may reveal new sightings of giant otters, monkeys, or many other rare birds. We arrive Quito and board the flight back to Quito where you will be transferred to your hotel. Evening at leisure. This morning we transfer you to the airport for your flight to the Galapagos. After a short flight you will arrive at Baltra or San Cristobal Island and after paying your Galapagos National Park entrance fee you will be met by your guide and transferred to your vessel to begin your cruise. You will be shown to your cabin where you will have some time to settle in before lunch and a welcome briefing. Your selected cruise then begins with the exact itinerary for the next 5 days being dependent on your choice of vessel. Over the next few days you will enjoy fantastic wildlife spotting including island landings and snorkelling opportunities with expert guides. Animals such as Blue and Red-footed Boobies, Galapagos sea lions, giant tortoises, land and marine iguanas, Galapagos penguins and frigate birds are only some of the unique wildlife found in this region. One of the most exciting things for visitors to the Galapagos is the incredible, close-up encounters with its animals which seemingly have no fear of humans. The volcanic Islands of the Galapagos also offer spectacular scenery, from active volcanos, to lava tubes and impressive red and white sand beaches. It is not only a wildlife haven but an incredible archipelago of diverse islands, and over the course of your cruise you will enjoy many zodiac landings and have the chance to explore them in detail. After a final island landing in the morning, you will be transferred to Baltra or San Cristobal airport in time to catch your flight back to the mainland. On arrival in Guayaquil you will be met and transferred to your hotel. Evening at leisure to explore and we recommend wandering along the waterfront and enjoying a meal. Cabins have ocean views and offer all the amenities to feel like home during your vacation. 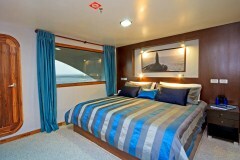 The boat features 8 cabins of which 2 have low queen size beds and the remaining 6 have low twin beds. Each cabin offers a private bath, hot water, air conditioning and a closet. All cabins feature individually controlled air-conditioning Double cabin Small desk, sofa, mini-bar, and closet, as well as spacious bathrooms with shower cabins. All main deck and upper deck cabins average 20 square meters in size including the bathroom. All cabins have big windows, which can be individually opened. The Galapagos Ocean Spray is a new catamaran that started cruising the Galapagos Islands in March 2012. Ten crew members and a bi-lingual naturalist guide are at your disposition to ensure a flawless operation. 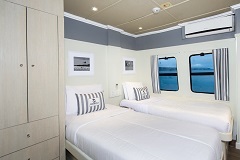 The M/C Ocean Spray has comfortable social areas that have been elegantly designed. The lounge has been fitted with large windows to provide panoramic views of the enchanting Galapagos Archipelago. The sun deck has comfortable loungers and a jacuzzi to relax and enjoy the sea breeze after a day of Galapagos exploration. Hotel rates are based on double/twin share lead-in rooms. Other room types and hotels are available. Rates are subject to change and different rates may apply during holiday seasons and special events.